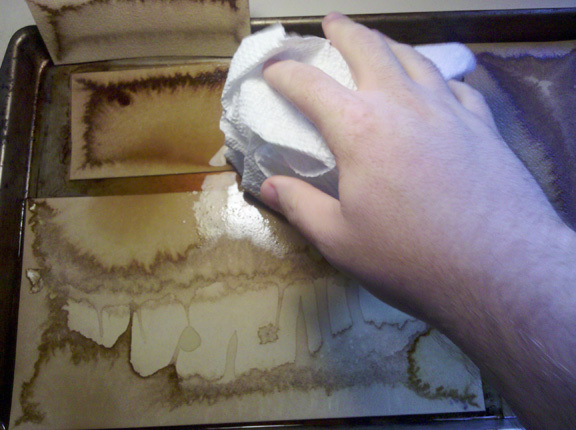 I’ve been asked a couple times how I go about the process of staining paper. 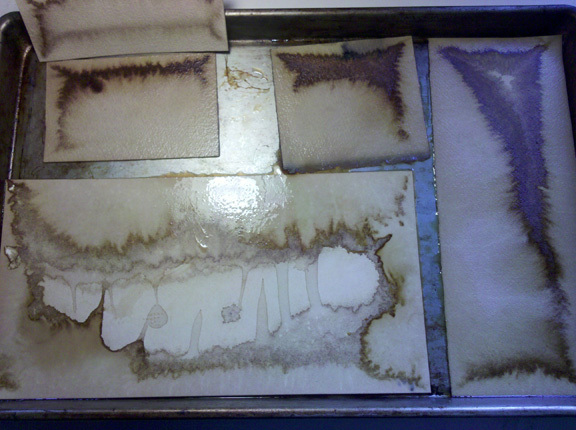 Since I had need of making more recently I figured it wouldn’t be a bad idea to document the process. My intention when I do this is to get some irregularity to the tone of the surface. When I’m looking at the page and it is already all marked up, psychologically I can loosen up and not be too precious with the marks I make. I try using those irregularities to inform the drawings while I work. Admittedly to mixed levels of success at times, but it’s not experimenting if you don’t botch it from time to time. Currently with my studio set up I work within a couple limitations. All involving space (likely a common issue amongst most of us). 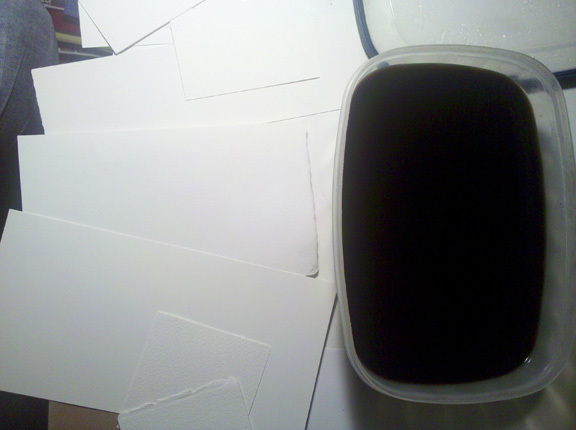 I don’t have anywhere to store gigantic tubs of old coffee, nor anywhere to let full sheets of water color paper dry from being soaked in said old coffee. So for the time being I’ve been mainly using the cut offs from larger projects for this. Sometimes if a cut off is large enough I may cut it down to more uniform (read: easily framed) sizes. But for sketches or warm up drawings I don’t mind the odd bit here or there. Anyway, onto the actual process. As far as materials go all you need is a Tupperware container full of old coffee and some bits and bobs of water color paper. I generally use 140# Arches paper which is easy to find at pretty much any art store. Although I have stained a few Strathmore Water Color Artist Cards and they worked fine as well. If there is someone out there interested, I happened to use EIGHT O’CLOCK COFFEE, but I’m sure any brand will do. For the coffee drinkers out there, I definitely don’t brew pots especially for this, if my cup happens to go cold or I have some left in the pot when I’m done I just toss it in the container. Nothing too surprising to start off. Throw a couple pieces of paper in at a time. I agitate the paper while it is in the coffee. I’m not 100% sure this does very much. It may well be a hold over from the time I used to spend in dark rooms. The paper floats to the top, so while agitating I tend to press it down into the coffee from time to time. The goal here is to make sure the paper is completely saturated. 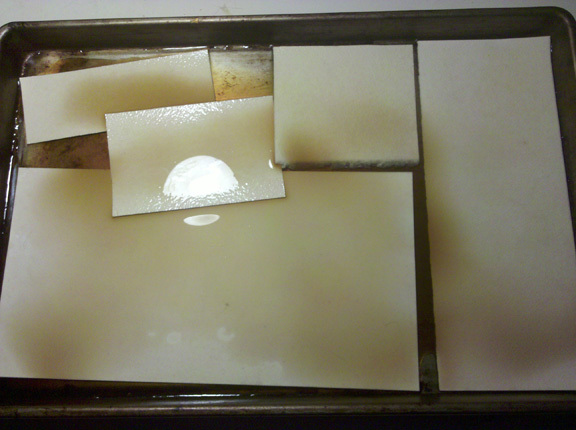 After a minute or two the paper should be wet through and pliable. 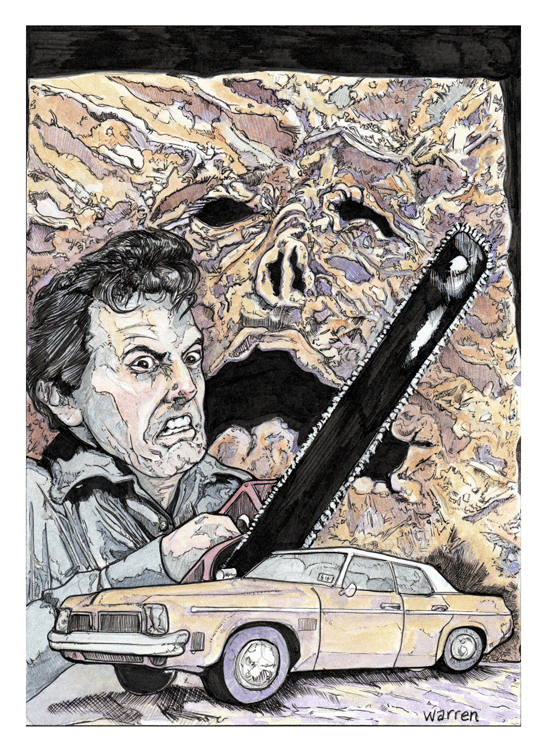 It will have also noticeably changed to a warm tone as opposed to the stark white. Now they are ready to move on. At this point the paper is a fairly uniform tone. If this is what I was going after I would hang these to drip dry then tape them to a piece of wood to stretch. Since that would make for a short tutorial, let’s move on shall we? So now I’ve got paper that has become fully saturated, it’s time to pull it out of the coffee and place it on the surface you’ll be letting it dry on. 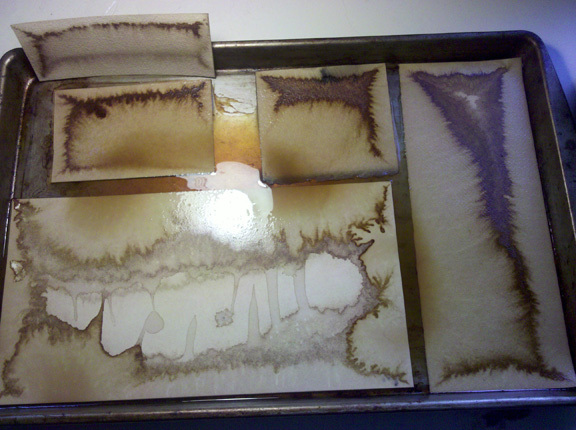 For now I’ve simply been using a large cookie sheet. All of the paper on this sheet has already gone through the previous step. 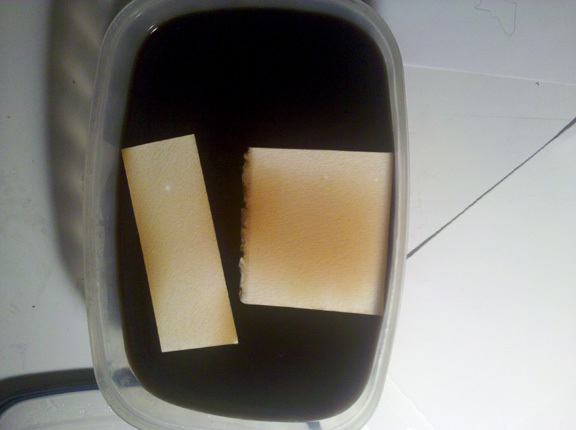 Once I’ve placed the paper on the cookie sheet I pour in a bit of the coffee from the container. Not a huge amount but just enough that I can slosh it about and allow it to pool up. Then comes the easy part, I set it under a hot lamp and walk away. 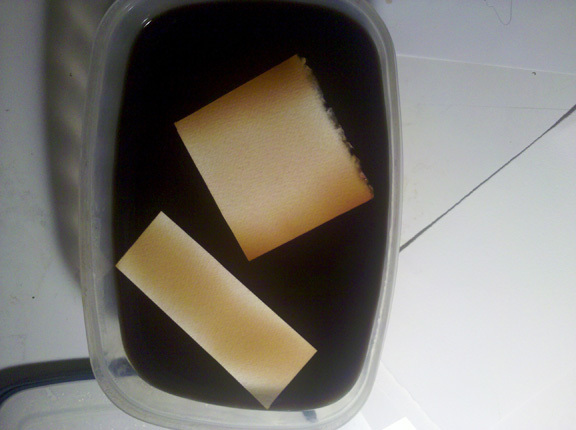 After about an hour or two you’ll start to see how the coffee is being absorbed into the paper. At this point I let it sit over night under an arm lamp, before taking any more pictures. And this is what I came back to the next morning. 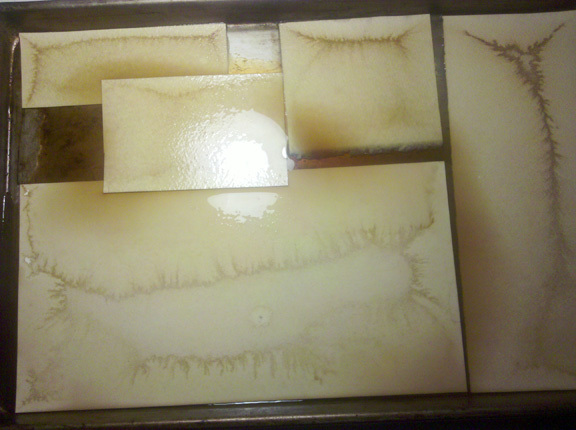 Now the staining is beginning to become a lot more pronounced. I did separate a couple pieces at the top of the sheet. The overlapping was causing more sticking than I’d like to deal with when the paper is dried. At this point it looks like there is still too much coffee in the sheet. 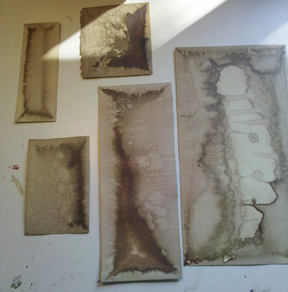 So I went ahead and blotted some of it up with some paper towels. Excuse the ape hand in the picture there. And this is the state I left them in for another few hours under the lamp. In this case about 8-9, but I doubt it actually took that long. I was away from home for that length of time. When I came back the paper had dried thoroughly. By adding the extra moisture to them when I place them on the sheet it seems to cause a bit of adhesion to the cookie sheet. 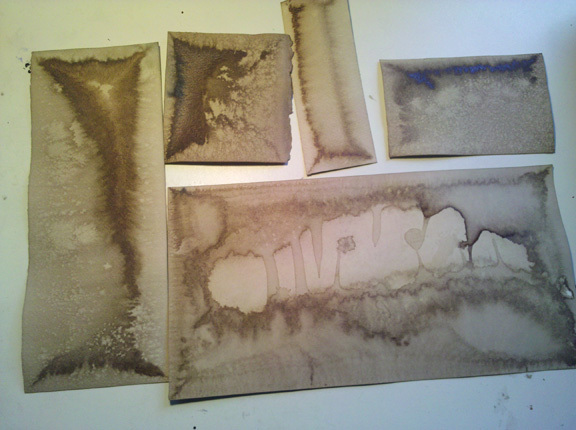 In a way I’d assume it works the same as stretching water color paper, except with coffee instead of water. You do have to be careful pulling the paper off of the sheet when it is dry though. There is still a bit of warp to the paper, which normally I don’t mind too much. But for the purpose of this tutorial, I went ahead and placed the newly dried pieces of paper, under a half dozen or so coffee table art books over night. Turns out big heavy books are good for much more than inspiration and taking up space. This is a really poorly lit picture with lots of sun ruining it of the newly flattened paper. The largest piece shown here is Hot Press paper while the others are Cold Press, which I think gives a pretty good illustration of how the two types of papers react to this process. The smoother tooth of the Hot Press is much less absorbent than Cold Press, but both types yield interesting textures to work on in my opinion. That really about sums up the entire process. Keep in mind the coffee itself is of course not water safe, so it does blend a bit with any wet media placed on top of it. This allows you to gain a range of tones from a single color. Which I really like to use to my advantage. As a point of reference The GOON and ABE SAPIEN sketches from my previous two blog posts were done on two of the pieces I stained in this batch. Anyway thanks for reading this. Feel free to give it a go. If you do I’d be really interested in seeing results done by other people. So by all means share up!